After yesterday's post, I guess I should explain a little more about Miller Valley. 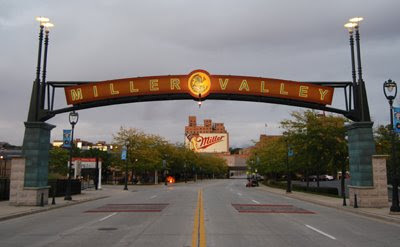 On State Street between 38th Street on the east end and 45th Street on the west end, is the Miller brewery, packaging, and distribution center. Frederick Miller purchased the Plank Road Brewery in 1855, located on this street, and memorialized in a building on the east end of the valley. As the business grew, more buildings were added, and today, the 7-block stretch is home of the largest remaining brewer in the state. If you've never taken a tour, I highly recommend it. We tried to take the tour a few years back but they wouldn't let us do it with a stroller. We took the Budweiser tour in STL and that was awesome! But you do have a point... there are a number of stairs on the tour, and it is not possible to take a stroller.